Sonic the Hedgehog. What gamer hasn't heard his name? After Alex Kidd, Sega created a new character to keep their consoles running and their new market power became easily recognizable. His first game was released for the Master System, Megadrive/Genesis and Game Gear in the same year and sold in incredible numbers, with good reason. Out of every Sega character from every game they ever released, he is easily the most memorable and nearly anyone knows who he is up to the present day. Even children recognize his image, so it's clear he's definitely had as much as an impact as the likes of Mario. We'll try to stay focused on his relation to the SMS during our investigation here, but it's impossible to avoid everything else entirely. Time to learn about Sega's most famous mascot. Sonic the Hedgehog went through a variety of changes in his career and looks quite different than he did when he first appeared. Still, he retains the basic design he originally was given; a blue body, spikey quills on his back, gloves, and his classic red running shoes. Previously, he was a bit frumpy and was progressively altered until he became more sleak and thin. The former design is the one found in his Master System titles, so let's start there. Early in 1990, Sega gave a challenge to its design team, asking them to submit artwork for a new character, one that would hopefully lead to a game with wide distribution. Numerous ideas were submitted, some of which were used as characters in the Sonic series and others that were used later on for completely different games such as Ristar. 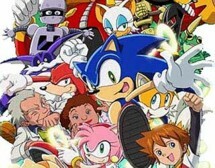 The most popular of the character designs, however, was Naoto Nashima's hedgehog. With their new character, the programmers then created a game around him with intense, fast platforming action and new plays on old ideas. Since we're only concerned with his history in relation to the SMS, we'll focus on the particular titles he appeared in before going a little further. In his first appearance, Sonic the Hedgehog in 1991, Sonic was pitted against Dr. Robotnik, who snatched animals (apparently on planet Earth, though this is never specified) and turned them into evil robots. Using his speed, spin attack and various power-ups, he has to take on the doctor in various machines before the final showdown. In order to get the best ending, players have to collect all of the hidden chaos emeralds scattered throughout the levels, a symbol that eventually became a series staple. The first title was essentially the same on both the 8-Bit and 16-Bit systems, but many players have a particular fondness for the former. Once they were released, Sega was skyrocketed to the front of the video game market, a position they would never hold again in their further console ventures. Sonic replaced Altered Beast as the pack-in title for their 16-Bit console and became the game programmed into European and Brazilian SMS IIs, but was sadly only an import on the NTSC market for the Master System, becoming one of the rarest titles in spite of the fact that there's little difference in packaging. For those of you interested, the only way to tell the difference between this and the others is a simple UPC sticker placed over the original. You may want to watch how much you pay for a sticker but a few auctions over the past few years have reached well over the 150 dollar level. After realizing the success of their new mascot and having sold millions of copies and consoles worldwide, Sega took a further step with Sonic and lead him along his path of fame. 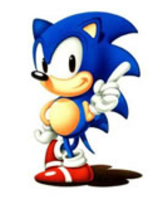 Unlike Alex Kidd, whose image was pushed before it even developed, Sonic took off among gamers and became an instant success. 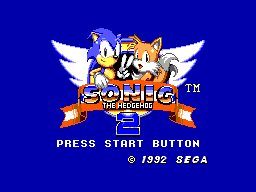 Thus, the next step was taken with the release of Sonic the Hedgehog 2 in 1992 for the Master System, as well as the Genesis/Megadrive and Game Gear. 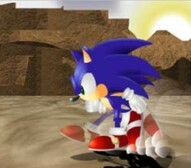 Along with using the features that made the first game so popular, the programmers at Sega threw in several new ideas, including the first appearance of 'Tails', Sonic's dual-tailed fox friend who became yet another classic figure that most people remember if they're familiar with the game. 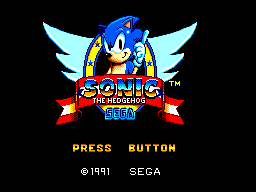 Unlike the 16-Bit version, on the Master System players can only use Sonic. Tails has been captured by Robotnik and can only be saved after you pick up the six Chaos Emeralds. This title added several features such as the ability to smash through walls, the ability to regain some of your lost rings when hit, hang gliders, a silver sonic at the end, mine carts and a few other tricks. Some players consider it the hardest and best game in the Sonic series for the Master System, but regardless it's a great title indeed. 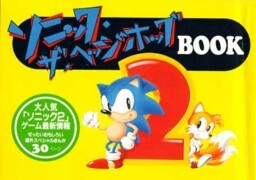 At this time in his life, Sonic became so popular that a Japanese manga series was released later in the same year as this title, though not in conjunction with it so don't get excited. Following this, and with his success growing steadily, Sega took Sonic to the next level. Luckily for Master System fans, a new game was released that was only manufactured for the Game Gear at the same time, not the Genesis/Megadrive. It would eventually appear as a special feature in later video games, but for 1993 SMS fans were treated to their own title. In Sonic the Hedgehog Chaos, Dr. Robotnik is at it again and has managed to capture one of the Chaos Emeralds. Unless balance is restored to South Island (this is the first mention of Sonic's home in the Master System series), the evil doctor will gain control of the other emeralds. 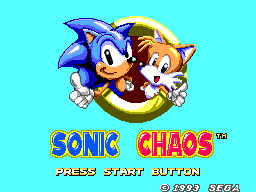 Chaos was the first title to feature Tails as a playable character, but the rest of the gameplay is essentially the same as the other titles, though now Sonic and Tails now have the ability to do a 'Super Dash Attack'. In addition, Tails can fly and can be manually controlled while in the air. 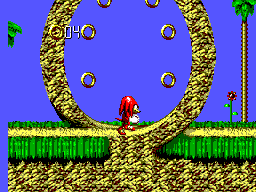 Though in some respects much faster than its predecessors, with better graphics, Chaos is usually viewed by fans as too easy because the emeralds are no longer hidden in levels and simply appear at the end of bonus rounds, thus making it possible to run through the entire game in less than an hour without really caring where you're going. It was also somewhat of a disappointment in that Tails was only selectable and a two-player feature was not added to the game. Regardless, this only further bolstered Sonic's reputation. During this time he now had a comic book line in America that is currently running, albeit under a different title, and even a television show that ran from 1993 until 1995 in the United States and Canada. Though the NTSC market was not given the additional SMS titles as the rest of the world, his 16-Bit status was continuing to blossom as Sega added in two additional titles; Sonic Spinball and Dr. Robonik's Mean Bean Machine; these were then added to the Master System's library. The latter, however, does not officially feature Sonic in any way, so it cannot be rightfully considered part of the canon, it is only mentioned here for the fact that it delved further into Robotnik's character, providing more of a background for later games. 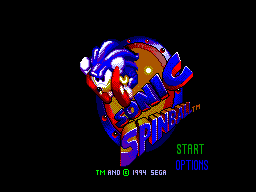 Sonic Spinball (or to be accurate "Sonic the Hedgehog Spinball") was released for the Master System one year after its 16-Bit counterpart. This time, Dr. Robotnik has hatched a plan to turn the creatures of Mobius into robots using a giant 'Volcano Veg-O Fortress'. This is the first mention of Mobius, which appears to be Sonic's homeland, though this was never indicated in previous games. In Spinball, the player controls Sonic, who is thrown up and through the fortress in a vertical pinball game, with some control over Sonic given to the player aside from using flippers. 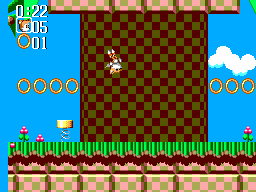 Enemies from the series make their appearance, as well as the Chaos Emeralds, which must be located in each level in order to open secret passages and get closer to stopping Robotnik. Though a radical digression from the series, this title did for Sonic what Sega failed to do with Alex Kidd, it turned him into a character whose image could be applied to almost any gaming concept. Though generally the rarest in the series, most Master System fans are fond of this title. Unfortunately, Sonic's time was almost up with the SMS, though not for the rest of the world. During this time his popularity continued to grow with the release of Sonic the Hedgehog 3 for the Genesis/Megadrive, as well as Sonic and Knuckles, both of which sold millions of copies worldwide. So what came next and where did Sonic go from there? Let's find out. Unfortunately for us Master System fans, Sonic's final system appearance was not the greatest, though it does have its charm. 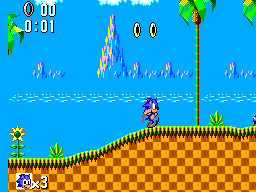 Sonic Blast was released in Brazil in 1997, one year after the 16-Bit title referred to as "Sonic 3D Blast" or "Sonic 3D Flickies' Island." 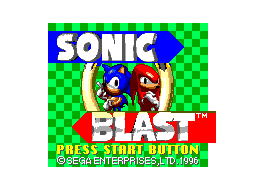 Apparently released as something of a competitor to Nintendo's rendered graphics in "Donkey Kong Country," Sonic Blast features said style as well as bigger characters and the only Master System appearance of a later character known as Knuckles the Echidna (a type of spiny-looking anteater). Sonic has relatively the same abilities, while Knuckles can perform actions similar to Sonic while also being able to glide and climb walls. Though visually impressive at points, this title is notorious for graphical slowdown, flicker and an extremely easy difficulty setting. Even its 16-Bit counterpart received luke-warm reviews. Regardless, at this time, Sonic had skyrockted and his career would only go further. Though he would no longer appear on the Master System, Sega never stopped his development. The Master System was part of Sonic's great career and certainly was partly responsible, at least in Europe, for his worldwide popularity. As time went on, Sonic was utilized in numerous titles and became a stock character akin to Mario and his friends at Nintendo. He is easily one of the most recognizable characters in the video game industry, and one which nearly anyone could name at first glance. Sonic, as well as his old friends and numerous additions, appeared in games for the Sega Saturn, Sega Dreamcast, in the arcades, on the Xbox 360, as well as numerous cameos in nearly everything one could think of in popular culture. There seems to be no foreseeable end in sight for Sonic's career and he appears to have gained one of the most notable positions in the video game industry. With current and up-and-coming developments, such as the Sonic X television series, which is still running, we Master System fans can look fondly at a character who helped to give popularity to the console we know and love. From his first appearance to his last, Sonic the Hedgehog has grown into a pop-icon the likes of which video game history may never see created again.